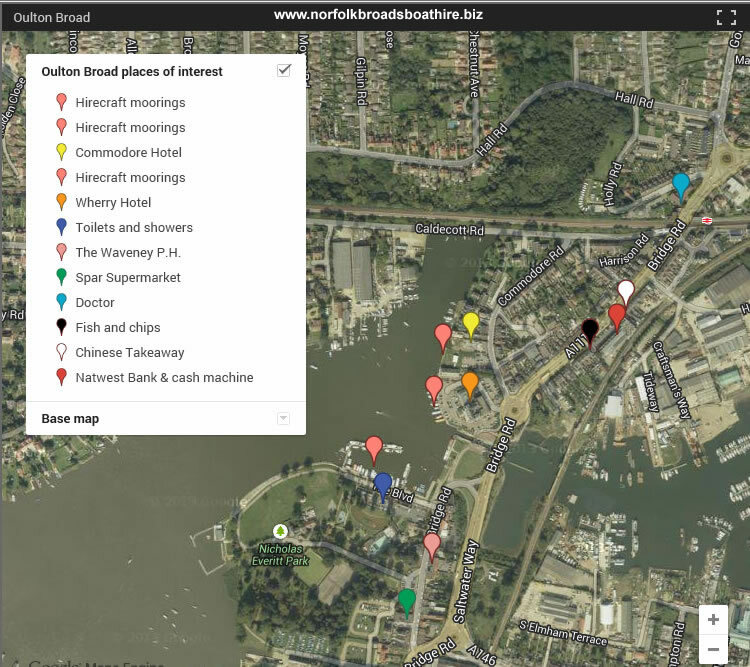 Oulton Broad lies a couple of miles inland from the seafront at Lowestoft and as it's name suggests, is a wide broad bordered by parkland, millionaire housing, reed beds, marinas, hotels and bars. Moorings can be found at the furthest end of the broad from Oulton Dyke, which is the waterway you will come along to enter the broad. The Yacht Station (not just for yachts) has plentiful moorings as does the Wherry Hotel (pictured above) where you have arguably the best view of the broad from your moorings. The Hotel clearly realises that as they charge £10 for an overnight mooring whereas you can stay at the Yacht Station for £7.25 per night. The rise and fall here is 2ft 3inches so set your ropes with enough slack in them to allow for this. Also as mooring is usually stern-on (reverse up to quay and moor with front pointing into the broad) and your boat will be higher than the moorings when the tide rises, you need to be sure the stern of your boat will not then get caught on the quay heading when it drops again. Your boat may have large fenders hanging on it's stern to stop it getting too close to the quayside. If not move some of your side fenders to the stern to keep it away. Local Attractions: Powerboat races are held most Thursday evenings in the summer and on certain public holidays. Nicholas Everrett park is adjacent to the broad and offers some lovely walks and views over the waters edge. Take the train from Oulton Broad North or Oulton Broad South into Lowestoft for a day at the seaside. Lowestoft Museum is located in Nicholas Everrett Park. Carlton Marshes Wildlife Trust, a short taxi ride away is a miniature Broads with drained flower marshes. Watching other craft coming and going and the yachting on the broad. Eating and Drinking: Wherry Hotel - Restaurant and bar food. and daily carvery. It boasts a terrace overlooking the broad. The Waveney is just up from the Yacht Station, opposite park gates and also features a good choice of menu. The Commodore also overlooks the Broad with it's own limited moorings and offers an extensive choice of menu. Lady of the Lake - (extensive menu) is over the road from the Yacht Station and has regular evening entertainment. Tides Steak House, Red Herring, Labone Indian, China Garden are all restaurants a short walk of the moorings. Mermaid Fish and Chip Restaurant and takeaway is on Bridge Road - past The Wherry from the the Yacht Station. Other Services: Supermarket - turn right from the Yacht Station. Public toilets and showers available at the Yacht Station. Nat West bank and cash machine. Doctor's surgery. TIP: Speedboat racing takes place on Oulton Broad most Thursday evenings. You will get a great view by mooring outside the Wherry Inn, which faces out onto the racing circuit.